He is the co-founder of the journal Java (28 issues from 1989 to 2006) and coordinated the issue of the literary magazine on "New French Poetry" (March 2001). Since 2002 he devotes himself exclusively to writing. Many public interventions (readings, performances, conferences, etc.) in France and abroad. He works and has worked on several multimedia projects (see "Creations") and joined at the end of 2006, as a drummer, the punk-rock band Prexley. 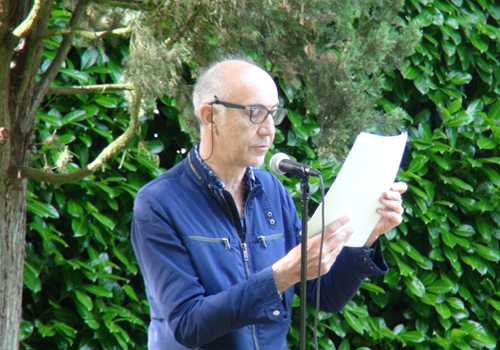 Poet unclassifiable, Jean-Michel Espitallier plays on several keyboards and according to procedures constantly renewed. Lists, diversions, rhythmic loops, repetitions, offspring prose, false theorems, logico-absurd propositions, sophisms twist the neck to the so-called notion of poetry by inventing new forms to continue to play all the weirdness of the language and to test the limits. Between yellow laughter, comic tension, empty syllogisms, absurdity and derision, the poetry of Jean-Michel Espitallier, close to that of contemporary art, uses the most radical fantasy to stick a false nose to the tragic and to the spirit serious but also to shatter and problematize even more, the notion of gender and aesthetic boundaries (so ethical ...).